I always find it amusing to read headlines from the business press (and their web sites) regarding macroeconomic news. In particular, headlines about exchange rates many times refer to dramatic movements in currency prices. No doubt that some currencies are very volatile and there is room to talk about interesting changes affecting exchange rates, but it also seems the case that most of these headlines do not correspond to what one sees in the data. Days were there is very little movements in exchange rates produce headlines such as "Dollar tumbles" or "Euro falls sharply". As an illustration, I have collected headlines regarding the US dollar / Euro exchange rate for the last thirteen days (source CNBC.com). What we see is a succession of headlines (and stories) that talk about dramatic upward and downward movements of this exchange rate. There are days where one can even get three headlines on this subject, each of them pointing in a different direction. The list of headlines is below, together with a plot of what the Euro/Dollar exchange rate did during those days. Interestingly, despite the dramatic tone of the headlines the exchange rate was very stable moving in a range 1.4350 to 1.4500 (which is a fairly narrow range for this exchange rate). 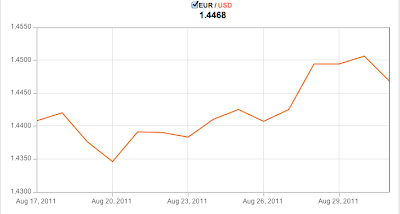 Dollar to Hit $1.50 to Euro? A move in the opposite direction would have made it to the headlines of all financial newspapers but, just in case you missed it, here are the yields on 10-year government bonds for Ireland and Spain. They are still high relative to where they were before the crisis but they have been falling very fast over the last weeks. Some of this fall has to do with lower interest rates everywhere else (so the spread with the German yields has not fallen as much as what you see in these figures), but from the perspective of sustainability of government debt what matters is the interest rate you pay on your bonds and not the differential with a safe asset. The debate between whether governments should focus on helping the economy grow faster or imposing discipline and austerity in their budgets is not going away. No one disagrees with the statement that governments needs to find ways to bring discipline to fiscal policy. Given current policies, governments are on an unsustainable path and there is a need for reform that will require a combination of lower spending and additional source of revenues. 1. Bringing sustainability to public finances is about ensuring sound fiscal policy over the coming decades, not months. For many of the advanced economies, the future deficits look worse than the accumulated debt. Putting fiscal policy on a sustainable path requires reforms that should be long lasting, and we are talking about decades, not quarters. The difference between implementing these reforms in 2011 or 2013 is insignificant compared to the challenge that governments face. What matters is the commitment to get it right in the long run, not now. Yes, what governments do today could be a signal of what they will do over the coming decades, but this is only true up to a point. There will be new governments in the coming years and what is really required is not a contractionary budget one year but a structure and a set of constraints that ensures discipline for future governments. 2. The need for additional fiscal stimulus is based on the assumption that we are not in a normal year. If unemployment was at a normal level, if the output gap was zero (output was equal to potential), then there is no reason to postpone the necessary adjustment. But there is a dimension of economic policy (both monetary and fiscal) that works towards the stabilization of the business cycle. We do not expect monetary policy or fiscal policy to be the same in a recession than in an expansion. And while fiscal policy might require to show discipline over the coming decades, the amount of discipline should be different depending on the phase of the business cycle. 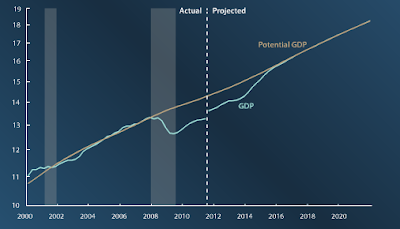 Letting the economy be producing below potential for a long number of years is not only socially costly but it leads to a permanent loss in output which is a potential source of tax revenues. 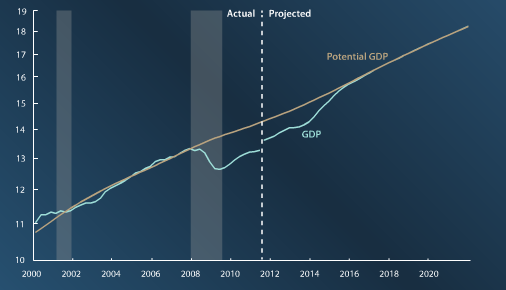 And the most recent projections from the CBO (Congressional Budget Office) in the US show that GDP will be significantly below potential output for about 8 years, from 2008 to 2015 (see image below, source). If we accumulate the output gap for all these years we are talking about a $5.1 Trillion gap that represents a permanent loss in output (and income, and tax revenues). Some might see this as a natural and unavoidable adjustment which almost amounts to claim that GDP and potential output are identical, the output gap is zero, unemployment is all structural. But given that the US economy has a strong tendency to return to its trend regardless of economic shocks, it is difficult to argue that there is no output gap to be filled in 2011 (or any other year before we get to 2015). I agree with Daniel Gros that Eurobonds are not the solution to the current European crisis. I also do not understand the argument that economic and monetary integration in Europe is failing because of the lack of political integration. 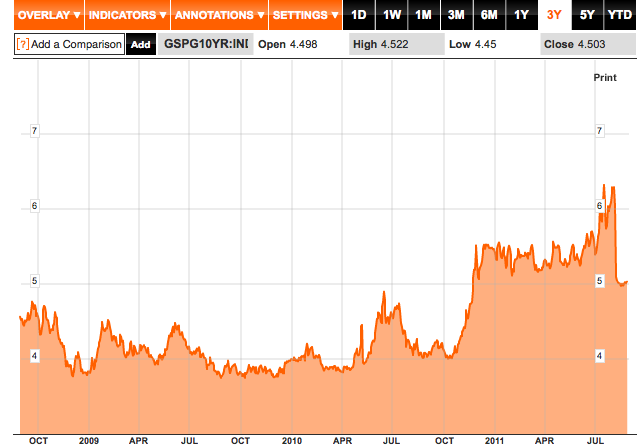 The only possible argument in favor of the idea that Eurobonds (or more political integration) would have solved the current crisis is that Greece, Portugal, Ireland, Italy or Spain are all doing fine and their only problem is that they are being attacked by speculators in such a way that the (high) market interest rate makes them insolvent. By attaching a different label to the bonds of these countries, the speculators will not be able to attack them anymore. 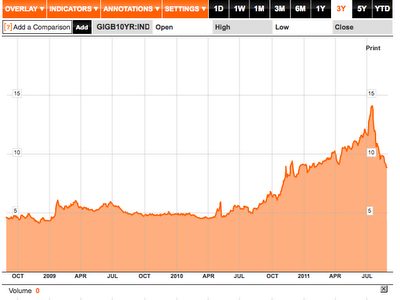 There will be no PIIGS bonds out there, only Euro bonds. This is a possible story and if indeed speculation is the only source of all of Europe problems, this might work. There are, of course, other solutions to the problem: a guarantee by the German or French government or by the IMF or the EFSF or any other credible institution that the bonds will be repaid and the interest rates will adjust to a level that makes those governments insolvent -- this is to some extent the solution being adopted. The idea that having German tax payers being responsible for the debt that all Euro governments issue sounds not only politically unfeasible but also, from an economic point of view, it could have made matters worse instead of better. What is needed is a credible and transparent fiscal framework that ensures sustainability of public finances. Hiding the "country label" when issuing bonds or pooling all the risk together and making all taxpayers responsible for the misbehavior of any government does not seem to be setting the right type of incentives. One could argue that the same argument applies to the Euro as a common currency that replaced the national currencies of countries with limited credibility. Does this mean that the creation of the Euro is also a bad idea? No. Sharing a currency is very different from sharing a label (and the risk) when issuing bonds. Sharing a currency does not imply sharing the risk of unexpected changes in income or the cost of the mistakes that national governments or central banks might do. Dow Jones at 11,000 might not be that low. Here is an interesting article from the Federal Reserve Bank of San Francisco on the potential effects that demographic changes could have on the stock market in the US over the coming decades. As baby boomers retire and sell their assets, including stocks, their prices are likely to go down. The issue is not new and has been debated before but what is novel in their research is the correlation between a standard measure of the demographic composition of the population and the price-earnings ratio in the stock market. The image below shows the price earnings ration (P/E) and the ratio of the middle-age cohort (age 40-49) to the ok-age cohort (age 60-69). This is labelled as M/O in the chart. There is a clear correlation between the two series. Their model generates a return of the P/E ratio to the low levels of the late 70's early 80's. There remains, of course, uncertainty about this prediction given that it relies on many factors (such as demand coming from other countries, changes in retirement age), but the correlation of the first figure provides a strong enough argument so that the issue cannot be ignored.